Susannah Cahalan is a young journalist working her way up in the New York Post when she suddenly starts feeling different. She starts experiencing hallucinations, delusions and paranoia, but the doctors she sees can't figure out why. They do all sorts of tests but cannot come up with a diagnosis, and eventually she gets so bad, she ends up strapped to a bed in a hospital. 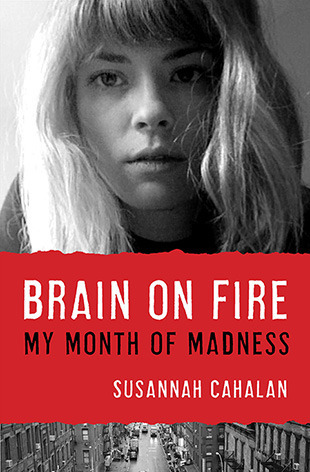 Brain on Fire: My Month of Madness is Susannah Cahalan's memoir of this time, although it's really more of a journalistic account of her experience. Some of the women in my book club were disappointed in this journalistic style, whereas I actually enjoyed it. I found the medical mystery fascinating, particularly the details about how the brain works and how the doctors worked to figure out what was wrong with her. It was a bit scary, too, to think of all the people who end up with unknown illnesses and are never diagnosed correctly. When the illness gets so bad she that she is having seizures and lashing out at everyone around her, Susannah is finally admitted to a hospital. Because she cannot remember the month she spent there, she wrote most of the book based on interviews with her parents, friends and the doctors who treated her. She also used notes her parents kept during her hospital stay and videos from the hospital. This gave her the ability to share this "month of madness," first in a New York Post article and later in this memoir. It also made this more newsy than memoir, since she can't actually remember how she felt during that time. The book begins before her illness and she describes some of the first signs that she does still remember. Then, she gets into the month she was in the hospital and the path her doctors took to finally diagnose and treat her. Finally, she talks about the aftermath. It's a bit of a shocking story, given the fact that this illness came out of nowhere. Overall, Brain on Fire is a great choice if you enjoy medical mysteries and don't get bogged down with talk of how the brain works. It got mixed reviews from my book club, as discussed above, but I really enjoyed it. This review was written based on a copy of Brain on Fire that I purchased.